Stephen Szczepanek of Sri Threads sent over another surprise package of magnificent things. Exquisite, inspiring things, thoughtfully chosen and gathered and kept for me that just magically appear on my doorstep. Here are a few highlights. There are fragments of garments with wonderful surprise linings. And beautiful wear and eccentric mending. I already have owls in progress and I’m thinking about using the blue silk bits below for spider bustles and some new flowers I’ll show you soon. Thanks you, thank you Mr. Szczepanek! Oh, very inspriing, especially the silk bits! I look forward to seeing your flowers. Ann, I have not left a comment previously, but I love my visits here. Everything you create is so magical. The old and worn textiles/clothing you show and how you incorporate these gems into your creations is so inspiring and perfect. It’s awesome to see a collaboration between two of my favorite blogs! I can’t wait to see the results! Lovely pieces of worn cloth. I can see all sorts of interesting uses. Spirit Cloth would approve as well. 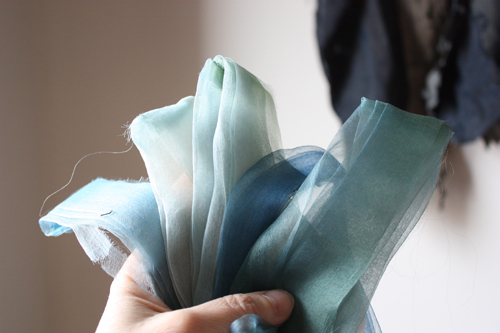 I am amazed that these worn fabrics get you inspired, it would take me weeks to figure out how to use them. I am very curious to see what your magic hands will make. Yay, they look…. umm.. great! 🙂 No, they really do, and it’s great to find out a little bit about where the lovely materials come from! I just can’t wait to see the new owls! 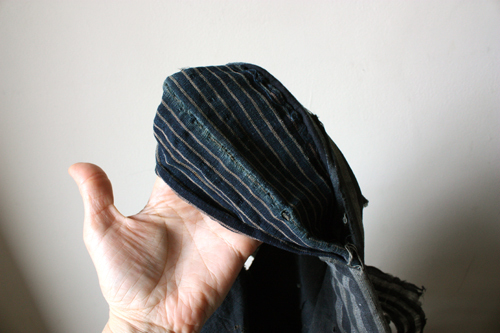 I can almost see the owls waiting to show themselves….will you be tempted to use the repaired fabric on your owls? I think it would look wonderful, especially on one a little worn looking (we all get there as we grow older!) Thank you for sharing, and thank you too Mr S. for supplying Anne with the fabric for her amazing creatures. The world is indeed a better place because of you. Hi Lisa – you’re right – I barely even have to show up – the owls just pretty much walk right out and I do love the mended and worn bits for them – scars and life lessons. Three cheers for Mr. S.
I believe the unique mending on the kimono-esque piece is called “sashiko”. Long time reader, but first time poster here. 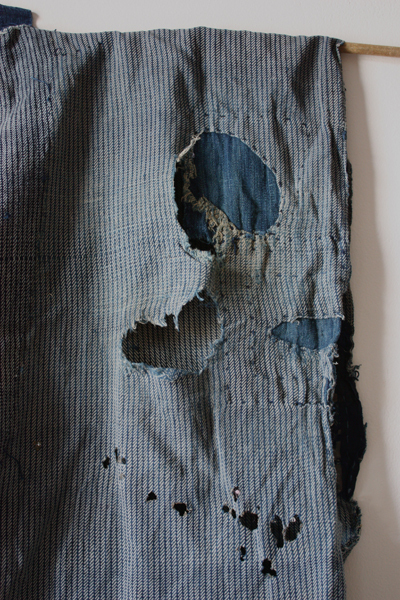 I adore seeing the before photos of your previously loved and well-worn textiles and then seeing you turn them into beautiful things that will be treasured and loved for many more years. Not only are you recycling garments, but I think you recycle the happiness that the garment once brought to its owner as well! It would be difficult to imagine the recipient of any of your pieces as anything other than blissful when it arrives. Thank you for making us all smile a little more! Oh, how I wish I lived close enough to visit Sri Threads! It is probably good for the old bank account that I don’t! I love seeing your raw palette and then the finally artwork. Amazing! Have fun with your new found fibers. What an incredible piece of (history) clothing! Was it hard to cut into it? Each photo is a work of art in itself. I look forward to the owls. How cool is that? What a terrific gift! Obviously Stephen is inspired but what you create, Anne. He will get a kick out of what you create with his finds. As we do. Great blog, I just saw you re-posted on another blog. I love all the paper work. The fabric in this post is really nice. I love all the texture. Sweet boats also. I RSS’d you and look forward to seeing more. Thanks for posting.